The way IT is delivered is changing, in the past 6 years we’ve seen the move from physical IT services, to virtualized IT services, and now through to hybrid/cloud services. This changes the original BSM model and we need to recognize it, and think differently. We’ve seen Software as a Service (SaaS) take off from ERP systems right into our own back yard with service desk solutions. We are now seeing Platform as a Service (PaaS), the delivery of a computing platform or solution stack as a service, think Google Apps Engine, or Force.com. We are also seeing Infrastructure as a Service (IaaS) - typically a platform virtualization environment - as a service leading to utility computing billing based on resources consumed. Sometimes the latter is just switched on and off depending on specific project resource requirements. With any of these the BSM model changes and the focus of management changes. We believe there are 5 critical capabilities required. 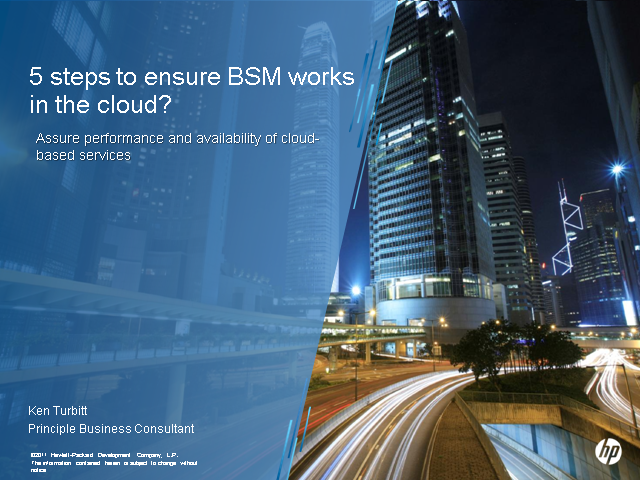 These follow the ITIL lifecycle and now need to be in place if you’re considering cloud adoption and BSM. Come and listen to this live webcast for more details.